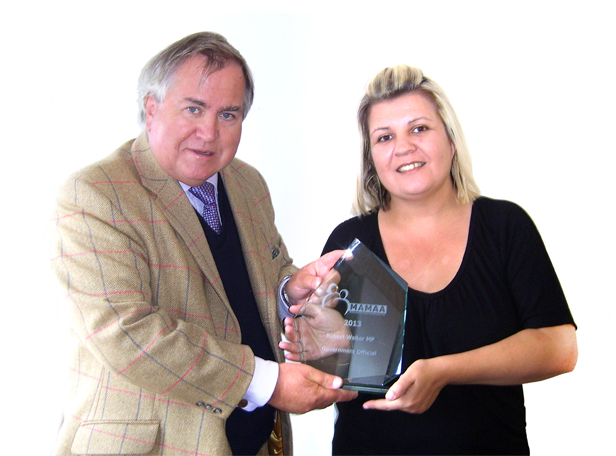 Robert Walter MP (North Dorset) accepted a MAMAA UK award on 11 October from constituent, Cathy Franklin, for his work to introduce Ryan’s Law to the Coroners and Justice Act. Mothers Against Murders and Aggression (MAMAA) spokeswoman and Blandford resident, Cathy Franklin, last month nominated Bob for his ongoing support and his help in her personal campaign to get Ryan’s Law introduced to the Coroners Bill. MAMAA Trustees considered all the nominations and decided Bob’s work with Cathy to reform sentencing policy was worthy of an award and deserved public recognition. Sadly, Bob could not attend the awards ceremony on 26 September due to official parliamentary commitments, so he asked if Cathy would do him the honour of accepting it on his behalf. On Friday, she delivered it in person to his constituency office in Blandford Forum and presented him with his award to say thank you. Cathy’s two-year-old son Ryan Franklin was killed by his father in May 2002. The body of baby Ryan was not released for burial until the trial and conviction of his father in November 2003. The coroner was powerless to release the body because defence lawyers claimed, despite there having been a post mortem and inquest, that they needed the body for evidence. After six months delay in November 2002, Bob Walter requested that the Coroner release the body. Unfortunately, due to the law at the time, the coroner was powerless to do so. The Ryan family suffered for 18 months unable to bury their child and, outraged at this abuse of the law, started a campaign to change it. Cathy and her family collected over 1000 signatures and emails in support of their petition to Parliament, which Bob presented to the House of Commons in September 2004. As a result of their combined efforts, the Government responded the following March saying that they were considering a change in the law to prevent other families suffering in the way that the Franklins had. Their persistence and determination eventually led to the inclusion of a clause in the Coroners and Justice Act 2009, which would see any waiting time for victims’ families reduced to a maximum of 30 days in all but the most exceptional circumstances. Bob said, “I am incredibly honoured to receive this award from MAMAA and was moved to have been nominated. Anyone who knows Cathy locally will know that the success of Ryan’s Law was down to her hard work and sheer determination to ensure that no other parent or family member would ever have to go through the agonising wait that she did to have her child’s body returned to her.